If you're looking to save money in the run-up to Christmas, but wouldn't mind splashing out on some quality music software, check out LinPlug's instrument-packed Synth Bundle. 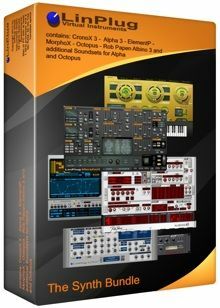 It includes all of the developer's synths including CronoX 3, Albino 3, Octopus, Alpha, Element P and the all-new MorphoX, plus extra sound sets for Alpha and Octopus. If you bought these beauties separately, they'd set you back $832, but until the end of this year you can pick them up for a recession-busting $399. You can find more details on The Synth Bundle here.